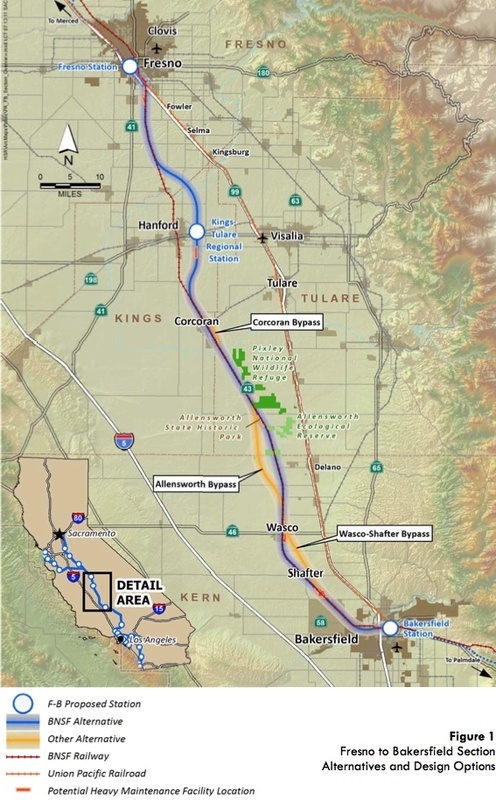 It’s a milestone of sorts: after years of talk, talk and more talk, the California High-Speed Rail Authority on Tuesday released two draft environmental impact studies on two segments of the bullet train project: Merced-to-Fresno and Fresno-to-Bakersfield (shown above). The Authority — the state agency charged with planning and building the project — has said it hopes to break ground on a stretch of track in the Valley next year. Whether that will happen is hard to say — there’s a lot of politics and funding issues in play here — but nothing can happen until the project is environmentally cleared and route options are narrowed to a final choice. The 45-day public comment period on the reports begins Aug. 15. The first two stretches of California’s proposed high-speed train system in the San Joaquin Valley would close dozens of roads, displace hundreds of homes and businesses, affect thousands of acres of farmland, and cost billions more to build than originally anticipated. But environmental impact reports released Tuesday for the Merced-to-Fresno and Fresno-to-Bakersfield segments say the statewide project would save more than $100 billion in new and expanded freeways and airport construction over the next 25 years, reduce automobile traffic and help improve air quality in the Valley and the state. To say the least, there’s nothing easy about this project. Still to come are the reports and decisions that need to be made to get the train through crowded Southern California and the Bay Area. The High-Speed Rail Authority also has highlights, summaries and the entire draft reports on its website. The two reports combined are more than 10,000 pages. The Authority also says that it has the funds in hand to begin work on the initial segment in the Valley from south of Madera to Shafter, which is northwest of Bakersfield. The big challenge, of course, is to find the $43 billion needed to construct the line between San Francisco and Anaheim. California voters in 2008 approved of a bond measure to sell up to $9.95 billion in state bonds and the federal government has said it will provide $3.5 billion. The sale of the state bonds depend, to some degree, on the ability to secure federal money and the willingness of state lawmakers to take on the debt. I can’t wait until this is finally built, and we can catch up with Western Europe and Asia. Im a supporter of the CA High Speed Rail but baffled as to how Anaheim got included into the initial segment. LA and San Francisco are the two largest cities in California and should be the end points of the initial segment. Anything outside that of could be accommodated by Amtrak Upgrades until High Speed Rail has the funds to build these extensions. Just building rail for rails sake doesn’t imply it’s efficient as those countries. They have dense populations; our line would go through rural areas. We need high speed metrolink style routes, not a cross-state line. I think it was wise to start in the Central Valley area, but not in a section where current passenger trains already run. The segment chosen will parallel current San Juaquin Amtrak service… They should have probably linked up Bakersfield to Palmdale over the Tehachapis which currently create a bottle-neck that freight companies won’t allow Amtrak to use. Once this is completed you’ve filled a gap that will, should funding dry up, serve at least Amtrak trains reducing the 12 hr trip significantly. This of course supplemented by grade sep’s and double or even triple tracking existing segments. While I like Metrolink, “high speed Metrolink” wouldn’t make any sense. You wouldn’t be able to get up to 200 mph, which is the goal of HSR. I would start planning the next section (to San Jose, or south towards Palmdale or Los Angeles) before this section is even finished. Ronny, San Francisco is only the fourth largest city in the state. By your logic, Los Angeles and San Diego should be the first to get connected (perhaps via Anaheim). Highways weren’t started in the cities. That should make us think how behind we are. We have to build smart, and not be scared by words like “Boondoggle” or “something something to nowhere” We need this alternative and it will get built the big cities if we approach this smartly and fund it properly and not give into a minority who just can’t accept that we need alternatives. Just because we are building this doesn’t mean we can’t also build our local lines. We need ALL THE ABOVE. I think it makes sense to have the train go through the cities in the Central Valley, but what I don’t understand is why it takes that roundabout detour through San Diego County instead of following the 5 through Camp Pendleton. Ooops. I suppose the correct statement should have been that the LA Metropolitan Area and SF Bay Area are the two largest populations centers in the state of California and the end points of the initial segment should be in the cities that are its cultural and financial centers, Los Angeles and San Francisco.